You don’t have to be a fishing guide to understand the importance of sharpening hooks. 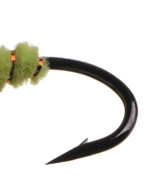 Just watch hundreds of fish eat flies and check the hook points when they come unhinged — usually the point will be rolled, dull, or even rusty. This week Phil Monahan provides an excellent reminder on why and how to sharpen hooks in MidCurrent’s Fine Lines.